Many online games feature extensive and realistic worldbuilding and have rich, complex environments that reflect reality, at least on a social level. Items in the game World of Warcraft are often traded for real world currency outside the game, as they are in many other games and some of these players invest time and money heavily to win. Some of those games strongly favor groups that can collaborate effectively. 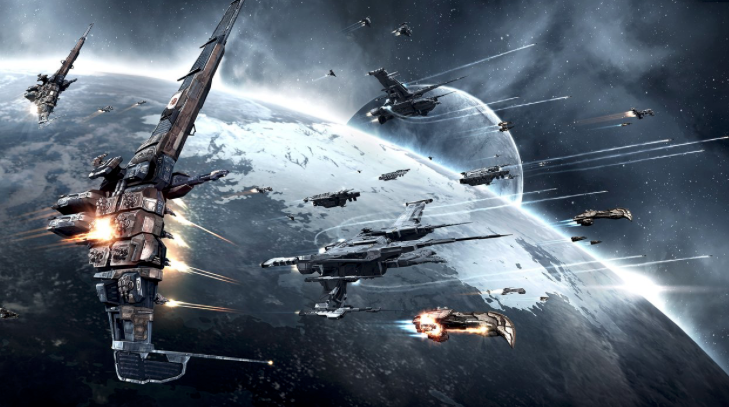 Ships in the game Eve online are costly and time consuming to build, with larger ships disproportionately more powerful than smaller ones. But ships also require certain support ships to operate effectively too, so even the most powerful players tend to band together. Moreover, powerful groups tend to attract powerful adversaries, or at least form tense arms races to maintain a balance of power. But sometimes that balance of power unravels in spectacular ways, most notably with a 22 hour battle in 2014 that cost many of the 7,548 players that fought it 600 ships worth $200,000 to $300,000 in real-world money. This huge battle was triggered by a software glitch that defaulted payments for rent on a giant battle fortress. A similar huge and costly battle resulted from a giant battleship accidentally jumping into enemy territory without support ships, and was swarmed before it could escape. Allied players poured in to the rescue, resulting in a giant and costly brawl for both sides reminiscent of the Battle of Jutland. The overall geopolitics of the game are strikingly similar to the real world, where a valuable asset straying into the wrong territory at the height of tensions has sparked crises and sometimes war. So it’s no surprise that players would maximize the rationality of their actions, take steps to ensure they are making the best possible decision that they can, and maximize their collaboration on the battlefield to win. I know a few military personnel who play the game, but I suspect they are a tiny minority in the overall player demographics. So what happened recently is all the more surprising. Anyone who has done military planning or been around military planners has probably seen the infamous “Leroy Jenkins” video and used it as a joke about (lack of) planning. In the video, a player is briefing a plan in detail to collaboratively attack a particularly difficult target. One of the players allegedly jumps into action before the briefing is completed and triggers the enemy defenses to the horror of the remainder of the group outside, who have no choice but to rush in and salvage what they know about the plan, and eventually just improvise until they are all dead. But what happened in Eve Online recently was demonstrably just the opposite. In 2016, a group built a fortress worth $15,000 and took months of planning to build. Many others have since built fortresses like them, and despite their vast power, over 30 have been destroyed in the most epic and costly battles of the game. But this first fortress (Keepstar) endured because of its strategic location made it much more difficult to assault and offered it control over vast resources. The fortress was built in secret and moved to the inside of a wormhole, which offers additional protection because openings appear only at random and disappear, and the openings collapse when too much mass passes through them. So an enemy fleet would only be capable of moving a few ships in before the opening to the wormhole collapsed, and nobody can mass a large enough fleet to challenge the station all at once. But recently a rival group spent 11 months of secret planning and collaboration developing a plan to destroy this fortress, which had dominated the game for years. Because of the unique difficulties even approaching the fortress, it cost $8,000 just to get things in place to prepare for the attack. The wormhole also made normal communications and coordination among the attackers much more challenging. They infiltrated a large force into the wormhole over time while maintaining excellent operational secrecy, and supported the effort with operational deception. Their planning also took into account the need to offset attrition to prevent culmination and consolidate gains (hold onto what they won) after the battle. They also dealt with security and combat to hold their supply lines to keep bringing assets and supplies into the main battle area and staging area. I plan to study this battle more closely to learn how these players, presumably amateurs without the benefit of much if any military planning experience, planned and executed something with the size, scope, and complexity of this magnitude. Did they study military planning, or did they develop their own methods? How closely does their method mirror the kinds of planning done by the military? What kind of methods did they use to learn about their operational environment? How did they plan something like this with such a vast and diverse group without being discovered? Regardless of how closely their methods mirror those already used by the military, it will surely make for a fascinating and compelling case study that will help military planners break out of preconceived notions by placing them in a different environment. Other kinds of organizations can learn a lot from this too. Everyone assumed the fortress at the heart of this battle was in a position of indomitable advantage, but a group took on that challenge and succeeded. How many organizations operate under conventional wisdom that certain things cannot be achieved, and how many fail while trying to challenge those assumptions? Here we have a group that figured out how to adapt and tilt the balance in their favor.